Pages xviii, 255 p. ills. Ritual has a causal impact on people's thoughts, feelings, and behaviors, benefitting even those who claim not to believe that rituals work. When it is done effectively, ritual deeply impacts all aspects of human existence sometimes consciously, often non-discursively. Ritual becomes a sacred moment. 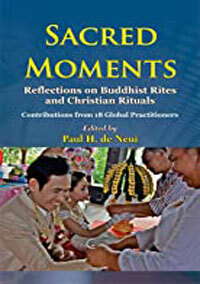 Believing that there is value in the dialogue, SEANET proudly presents its 15th volume, "Sacred Moments: Reflections on Buddhist Rites and Christian Rituals." Each of the eighteen contributors from around the world are practitioners familiar with the Buddhist context. Each recognizes that the absence of ritual creates cultural vacuum, and that contextualization of values is a challenging continual process. Reading these pages will move you to promote deeper mutual understanding, greater social transformation, and the reinforcement of the best of life in all cultural expressions. Paul H. de Neui serves as Professor of Missiology and Intercultural Studies and Director of the Center for World Christian Studies at North Park Theological Seminary in Chicago, Illinois.